that was a big opportunity. NAB has listened. "[That core audience] spends a lot of time with us and they spend a lot," ad product director Gary Liu told marketers at mLab. "Every 10 minutes or so we have an ad break so we get to talk to them 10-12 times a day." As 41% are early adopters, that means brand amplification for marketers, he said. The percentage of early adopters in the general population is around half that level. Brands should go after these early adopters "because they drag the rest of the population into your product. They change the behaviour of their friends and families. They are not passive about sharing. "If you give them a piece of content they will share it aggressively with their friends until their friends are convinced it is the next big thing." The firm said that while many big brands had successfully used music to grow their brands, many had been put off by the complexities of licensing agreements. Spotify touted its library of 20 million songs as removing that barrier. "We have opened up licensing so that brands no longer have to grovel (for rights)," said Liu. He said FMCG, packaged goods and entertainment brands were those that were under-represented and urged companies to think about what they want their brand to sound like. Australia might soon hear what NAB sounds like in its next major push, Joanne King, head of business bank marketing at NAB told AdNews. Spotify will be part of the brand's activity. "We've got a big brand campaign coming and part of that is seeding a really quite simple message about NAB. [Spotify] is right, if you want to increase the level of brand engagement you have to find emotional human connections that don't necessarily fit with the brand, [but] that get everyone to take notice and remember something from your past that you love. When you bring that feeling forward you associate it with the brand. "To be able to do that in a non-traditional space is very exciting. As a vehicle to extend that brand story, Spotify is so impressive." Food processing giant General Mills, which owns brands including Old El Paso and Nature Valley, hasn't used Spotify locally yet. Anna Potter, General Mills marketing manager for Nature Valley said the call to action on the sound of a brand was food for thought. "Spotify is a really interesting platform. What is the sound of your brand [is an interesting question]. Not just the tone but what does it actually sound like. Some brands are obviously more relevant [for Spotify] than others but [it is] particularly relevant for brands [aiming] to modernise or move forward with a younger audience." See what other top marketers made of Spotify and other technologies at mLab here. 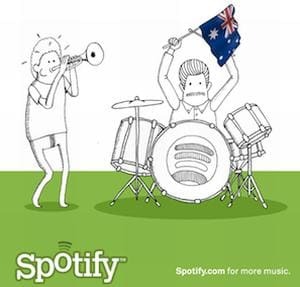 Spotify users spend an average of 107 minutes using the service each day. It has a male skew and 40% of users are in the 18 to 24-year old bracket. They share aggressively and they spend money. The music streaming service told marketers at mLab that was a big opportunity. NAB has listened.